Proposals to turn national programs over to the states are abound in Washington. The failure of federal programs over the past 60 years demonstrates that centralized solutions to local problems are ineffective. Federalism—the constitutional distribution of power between the states and national government— is once again on the agenda. Lessons regarding centralization have been learned the hard way. For example, since the 1960s the national government has spent $5 trillion on social welfare programs for such efforts as the “War on Poverty.” The result is a poverty rate of 15.1 percent—higher than the 14.7 percent rate we had before the Great Society. The nation cannot afford anymore trillion-dollar lessons. As an alternative, many leaders around the country are re-examining the role of the states. But is the rhetoric of the politicians sincere? Is there a genuine movement in Washington toward federal decentralization? Though national politicians often claim they seek to restore power to the states, a closer look at their proposals indicates otherwise. Consider Republican initiatives for welfare reform and environmental deregulation. Rather than abolishing burdensome federal directives like the Clean Water Act or fundamentally altering welfare programs, the initiatives simply direct the states to craft new methods for complying with those dictates. Proposals for block grants for school lunch programs mandate how states will use 80 percent of the funds. This is clearly not meaningful change. Rather than block grants, the states require a return of their sovereignty. Local citizens have a greater stake in the purity of their water and relief of their indigent than any outsider. Moreover, their familiarity with the resources available and community priorities is unparalleled. Efficacy is only one reason to return to the states their traditional powers. The Constitution delegates no power over local environmental concerns or welfare to the national government. The power of states and localities to craft their own laws is a key component of our federal system. Only when Washington once again accepts this will a serious discussion of federalism be possible. The Constitution defines a central government whose jurisdiction is limited to certain enumerated objects. The majority of governmental duties were considered local in nature and left to the states. Because of geographic and cultural differences, the framers of the Constitution knew that the people would require legislation tailored to their own unique circumstances. The power to craft a national policy for local matters was unfathomable to them. When one understands the original principles of federalism, one sees just how fraudulent today’s schemes that purport to return power to the states are. A return to the principles of the Constitution would be revolutionary. It would seriously curb Washington’s power. Therefore, it is highly unlikely that any real reform will come from Congress. The true voices of federalism belong to grassroots efforts like the Tenth Amendment movement. 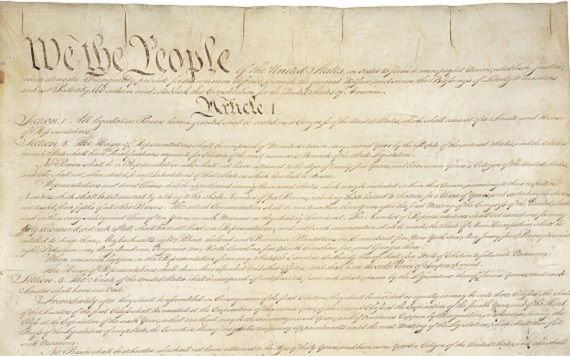 The movement seeks to give new life to the words of the Constitution: “The powers not delegated to the United States by the Constitution, nor prohibited by it to the States, are reserved to the States respectively, or to the people.” Part of their efforts include the Tenth Amendment Resolution which commands the federal government to cease and desist, effective immediately, mandates that are beyond the scope of its constitutionally delegated powers. It has been passed in 14 state legislatures and introduced in 17 others. Such grassroots notions about federalism look quite different from the block grants offered by the planners in Washington. These populist efforts would actually eliminate—rather than alter—unconstitutional edicts. Local leaders and citizens are serious about a return to the principles of strictly enumerated powers and self-government. The national politicians are not. The Constitution makes the federal government the agent of the states. Unfortunately it is now the master. Washington’s fraudulent federalism does not change this. It only clouds the real issue: the return of sovereignty to the states. This article was originally printed in the Third Quarter 1995 issue of Southern Partisan Magazine.